Imagine arriving in this gorgeous long chiffon mocha prom dress on your fantasy-filled night. 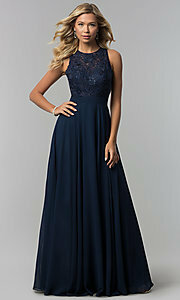 The beautiful formal dress is a feminine style with a trendy high neckline on the gleaming lace-embroidered bodice. Shoulder straps connect in back while beautifully framing the triangle-shaped cut out that extends to the sides of this lovely mauve evening dress. A band defines the natural waistline topping the billowing long chiffon skirt that flows to a romantic floor length in layers of silky chiffon. Whether attending a prom event, a black-tie wedding, or a pageant, this elegant long chiffon mocha prom dress is sure to draw an admiring eye as you make your dramatic entrance.